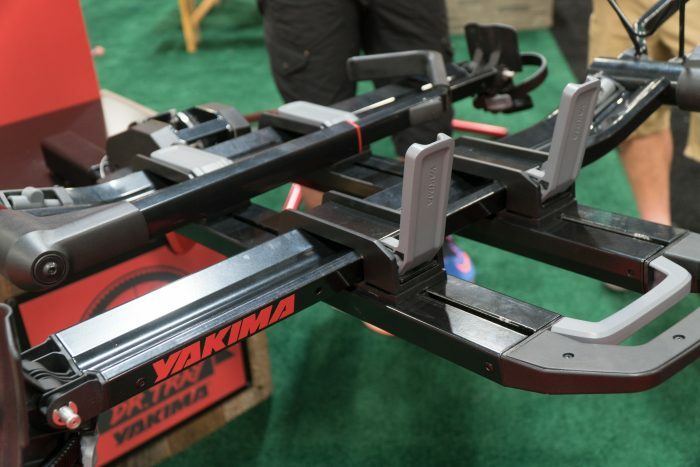 Yakima has been hard at work bringing new products to the market starting with their DrTray hitch rack. The DrTray offers ample adjustability and separation between the bike trays, with up to 18″ of clearance. This can be adjusted and fine tuned as each tray has two large clip lever style locks that release the tray and allow them to slide without the need for tools. 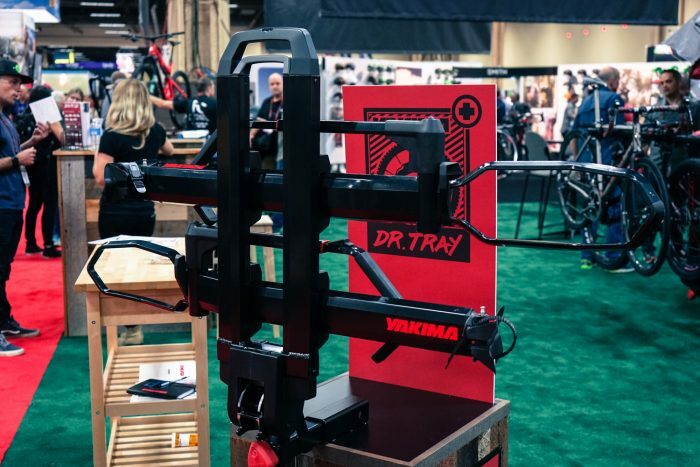 The standard rack has two bike trays, but if you can live with the bikes being a bit closer together (11.5″ apart) Yakima is offering the EZ+1 that snaps in and allows a third bike. This addition doesn’t affect the Remote Tilt Lever located at the end of the rack. The bike is held in the tray by a large hook and ratchet system that presses onto the front tire of the bike. The trays have large tire cradles and can fit your road tire all the way up to a 5″ fat bike tire with a load limit of 40-pounds per bike. The trays are equipped with an SKS cable lock system that can lock both wheels and the frame. 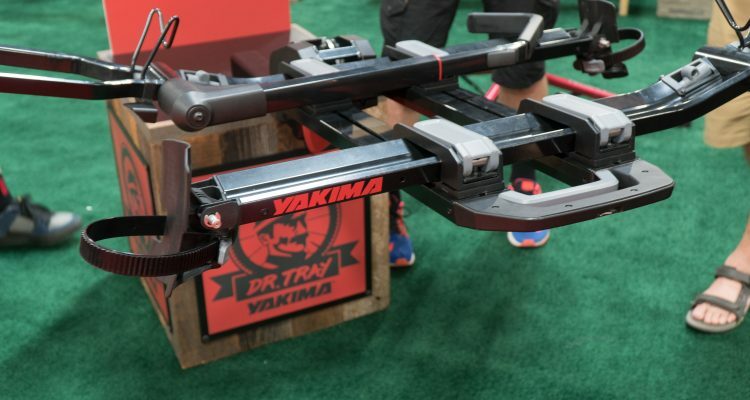 The DrTray will come in a 2″ or 1.25″ receiver hitch version, both priced at $579.00. The 2″ version weighs in at a claimed 34 pounds while the 1.25″ version will be a bit heavier at 37 pounds. Both use the Yakima locking SpeedKnob for easy and tool-free attachment to your vehicle. If you need to fit that third bike and opt for the EZ+1 it will set you back another $229.00 and add another 14 pounds to the rack. 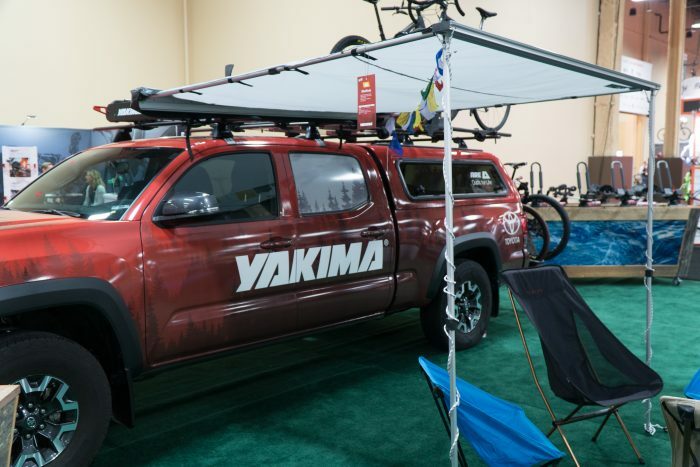 For those of us that like to make a weekend out of our events and skip the hotels, Yakima has you covered with two rooftop tent systems in addition to a lightweight awning, too. 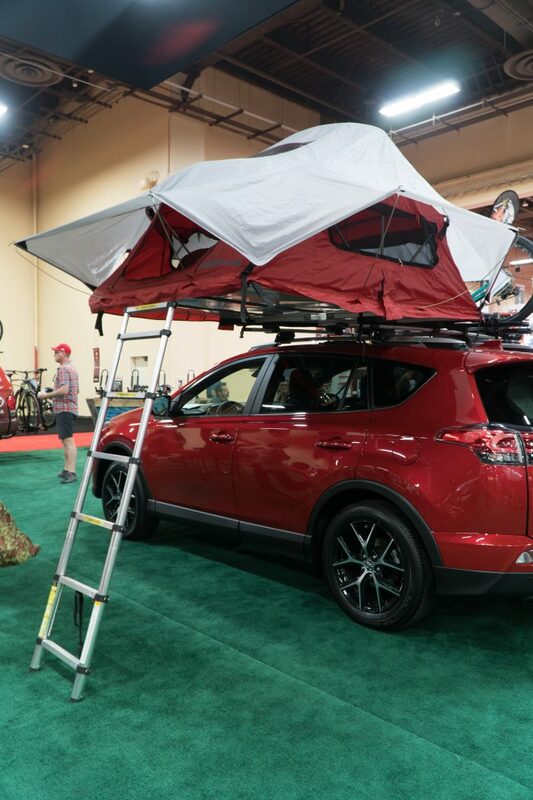 The rooftop tent is called the SkyRise and it will come in two sizes. We were told the small will sleep two adults while the medium will sleep three adults or two adults and two children. The SkyRise installs on a base rack and can be set-up quickly and easily. The medium’s dimension are 56” x 96” x 48” H when expanded and 56” x 48” x 12” folded, while the small is 48” x 84” x 42” H expanded and 48” x 42” x 12” folded. The medium weighs in at 90 pounds and is priced at $1349 while the small is 75 pounds and run $999.